A Friday night power/thrash delight, courtesy of a couple veteran outfits who have benefitted greatly thanks to their 80’s discography given a second go around in the digital consumption age. 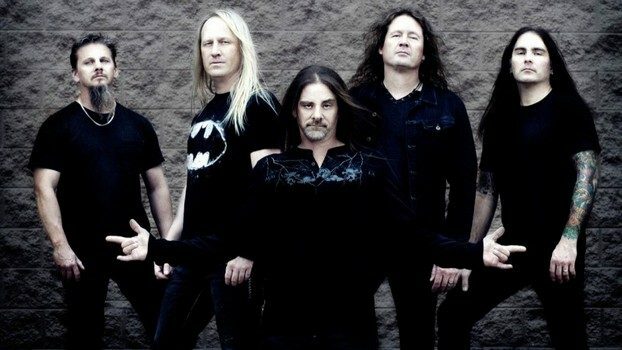 There’s something to be said for the history of the genre, and Flotsam & Jetsam as well as Helstar have made their mark through elevated musicianship and high caliber vocal melodies, creating songs that have the old guard clamoring to relive their youth once again. As well as bringing a younger contingent who never had the chance to witness these acts first hand in their early incarnations. Doors were at 7:20 pm, and one of the two locals to open the proceedings was in a bit of a bind as half the members were not there when the Chance soundman announced that ‘if they don’t arrive by 7:45 pm… your set time is getting cut’. As a result, Striven hit the stage at 8:05 and got 3 songs to showcase their fusion of grunge/ modern hard rock. When announcing their last song (a cover of Alice In Chains’ “Them Bones”), the stage manager made it very clear to the bassist Steve Riccio that this would be their final track. Somehow vocalist/guitarist Greg Capra felt it necessary to cajole the crowd into wanting ‘one more’… but luckily, the stage manager made it more than abundantly clear that their time was up. They were okay if you dig a third-rate version of Alter Bridge and the aforementioned AIC, but just felt like they were going through the motions in terms of ability, stage presence, and overall professionalism. Ryder from Queens, NY went on next- getting a full set of classic-oriented hard rock originals, with James Ryder gaining attention for his charismatic call to action moments (very Kiss arena oriented… ‘how you doing out there Poughkeepsie?’). What wasn’t so nifty would be the five-minute drum solo, where Matt Hass broke out a little John Bonham hand action. If you only have 25 minutes, another original or a full band cover would have been more appropriate. Points for breaking out the double neck guitar on the closer though. Hatchet return for another opening slot, fresh off a recent run with Metal Church that made a stop at the Chance in April. Many younger fans amped up the pit game for their whirlwind set, which also included in audience guitar action from Clayton Cagle while many followers circled around him. Songs such as “Fall from Grace” and “Vanishing Point” give off a vicious Bay Area Death Angel-oriented attack along with some furious shred lead action, even if at times you could hear the occasional crackle from the speakers. Decent reaction means the road work pays dividends. Helstar had to hurry onto this tour last minute when Death Angel slid onto the higher profile Slayer tour – which meant certain members could not be present as their day jobs came first. While many may be disappointed not to see guitarist Larry Barragan on this go around – as well as drummer Michael Lewis- we would get two Cage members in guitarist Casey Trask and drummer Sean Elg that were more than up for the challenge. Fusing together a strong vampire opera themed set list (plus vocalist James Rivera donning a black cap and fang teeth), it felt nice to hear the band churn out Nosferatu cuts like “To Sleep, Per Chance to Scream” and “Harker’s Tale (Mass of Death)” next to new album tracks “Black Cathedral” and “Blood Lust”. James is a master story teller, channeling the lyrics as one of metal’s consummate front man. There’s a reason why he’s considered the Mexican Dio… although I would put him up there with Rob Halford in his prime as well. Guitarist Andrew Atwood peeled off great lead breaks despite not hearing an adequate monitor mix on stage – the band closing with the early Burning Star classic “Run with the Pack”. The 150-something attendees gave the band respectful, hearty applause following their powerful, speedy nine-song set. And then there’s the headliners, Flotsam & Jetsam. With so many albums to choose from, these power thrashers possess one of the more melodic singers in the business with Eric A.K. – and he can continue to hit those piercing high notes, as second song “Dream of Death” didn’t disappoint. During their 90-minute set, you can feel a renewed sense of belief that the band is going to win over all audiences, while appealing to a second and third generation of metalheads beyond the long-timers of the 1980’s. Choosing to concentrate on a healthy smattering of the first two records (“Hammerhead”, “She Took an Axe”, “Hard on You”, “No Place for Disgrace”) and the underrated Drift for “Empty Air” and “Me” among others, they would also give a healthy dose of their latest self-titled offering, of which “Iron Maiden”, “Monkey Wrench”, and opener “Seventh Seal” went down brilliantly. The only disappointment to these ears: no Cuatro material like “Swatting at Flies” or “Wading Through the Darkness (picky, picky I know). The rhythm section of bassist Michael Spencer and drummer Jason Bittner really play into the pocket while navigating speed/ tempo change maneuvers – and guitarists Michael Gilbert and Steve Conley even got into a nice bit of lead break/ can you top this extended action during “Smoked Out”. Eric spent a lot of time fist bumping and air guitaring when he wasn’t nailing down those lyrics and melodies that we all know and love. 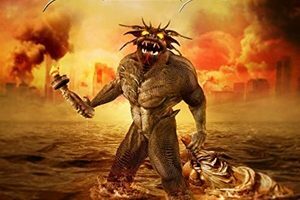 By the time set closer “Doomsday for the Deceiver” finished, we left exhausted yet enthusiastic that the band is regaining its rightful place as one of the best US power/thrash bands going.